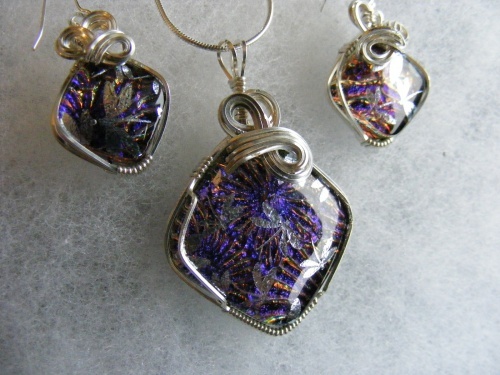 This set of dragonfly pendant and matching earrings is so pretty with its multicolor background and tiny silver dragonflies fluttering all over the piece. Adorned with sterling silver swirls to match the whimsy of the dragonfly, this pendant measures a little over an inch around and earrings are 3/4". Pendant comes with a sterling silver snake chain.